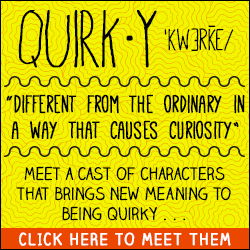 If you’re interested in reaching a “quirky” audience, advertising on quirkyalone.net and through Sasha’s Quirkyalone newsletter Sasha’s List is a great way to reach curious, creative, unique, self-aware types. We also host Quirkyalones Together Conferences that get media attention and you may want to consider sponsoring a conference. We choose advertising partners carefully to make sure they bring value to our members. Here’s an example of a recent campaign partnership with Open Road Integrated Media. We spotlighted great quirky characters in literature. If you’re interested in advertising opportunities, write us here.